The initial pricing for the 2014 Mazda3 has been announced and owning one of the newest and most efficient compacts in the US market won’t come cheap as the 4-door sedan version starts at $17,740 while the 5-door Mazda3 hatchback starts at $19,740 (prices include a destination fee of $795). The least expensive option for those buyers looking to get into a 2014 Mazda3 is the Mazda3i SV, which is only available in sedan form and comes with a price of $17,740. That makes the Mazda3i SV more expensive than the Ford Focus sedan, the Dodge Dart, the Toyota Corolla and the Hyundai Elantra but it makes the base 3 less expensive than the least expensive Chevrolet Cruze. The least expensive 5-door version of the 2014 Mazda3 is the i Sport package that starts at $19,740 – a price which makes it less expensive then the Ford Focus 5-door and the Toyota Matrix while being slightly more expensive than the Hyundai Elantra GT. In other words, the base pricing of the 2014 Mazda3 lineup puts it towards the upper end of the segment but it is far from the most expensive option among compacts sold in the US. The 2014 Mazda3i SV sedan that is available for $17,740 comes with a standard Skyactiv 2.0L engine mated to a 6-speed manual transmission – a drivetrain that is likely good for at least 41 miles per gallon on the highway (full official EPA figures are not yet available). This entry level package for the new Mazda3 also includes features like push button start, power locks, keyless entry, folding power mirrors, power windows, air condition, a 4 speaker AM/FM sound system with auxiliary input and much more. To be clear, this 3i SV package is not available for the 2014 Mazda3 hatchback. Those who want the Mazda3i SV with an automatic transmission will pay an additional $1,050. Those who want the least expensive option for the 2014 Mazda3 hatchback will be heading for the 3i Sport package – which is available for both the hatchback (again, as the base model) and the sedan. The 3i Sport package includes all of the features of the 3i SV sedan while adding Bluetooth hands free phone and audio controls, cruise control, a trip computer, a CD player and a tachometer. The Mazda3i Sport hatchback starts at $19,740 when equipped with a manual transmission while the 4-door sedan version with the identical features starts $500 less. As was the case for the entry level Mazda3i SV, opting for the 6-speed automatic transmission adds $1,050 to the final price. 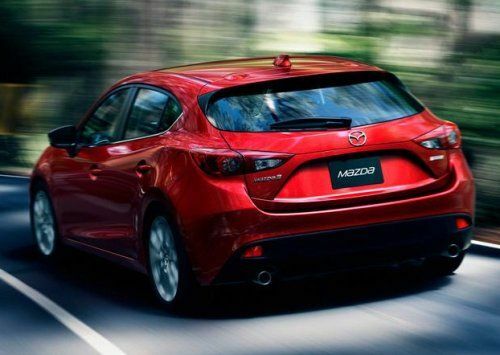 The next step up for both the sedan and hatchback versions of the 2014 Mazda3 is the i Touring package that begins at $20,390 (sedan) and $20,890 (hatchback). As is the case with all of the 2014 Mazda3i models, the 3i Touring package is powered by the Skyactiv-G 2.0L 4-cylinder engine and a standard manual transmission. The Touring package builds on the Sport package, adding 16 inch alloy wheels, heated exterior mirrors, a rear seat armrest with cup holders, Mazda’s advanced keyless entry/start system, package specific cloth seats, a rear spoiler, a blind spot monitoring system and leather wrapped features including the shift knob, the emergency brake handle and the steering wheel. Once again, the automatic transmission option adds $1,050 to the bottom line. The top of the line option for the 2014 Mazda3i is the Grand Touring package that begins at $23,540 for the sedan and $24,040 for the hatchback. This package builds on the Touring package, adding a 6 way adjustable power driver’s seat, leather seat covers and door panel inserts, heated front seats and a moon roof. Both of the 2014 Mazda3i Touring and Grand Touring models can add the Touring Technology Package which adds $1,600 to the price but includes a long list of features. Items like a seven inch infotainment screen, navigation, a rearview camera system, a 9 speaker sound system and much, much more. Those who want more power and slightly less fuel economy from their new Mazda3 can opt for the 3s package that is available for both the sedan and the hatchbacks in either Touring or Grand Touring trim. The key feature of the 2014 Mazda3s is the powerful Skyactiv-G 2.5L which is currently only available with a 6-speed automatic transmission although the company has promised that there will be a manual transmission option for the more powerful motor in the near future. The 2014 Mazda3s Touring sedan carries a price of $25,390 while the hatchback versions starts at $25,890 but to justify the $5,000 upcharge over the Mazda3i Touring – the company has done more than just change the engine. The 3s Touring also comes standard with 18 inch alloy wheels, HID headlights, halogen fog lights, LED taillights, LED daytime running lights, Mazda’s Active Driving Display, steering wheel mounted paddle shifters, a 6 way power driver’s seat, and heated leather seating surfaces in addition to all of the features of the 3i Touring fitted with the Technology Package. The 2014 Mazda3s Grand Touring also comes with a significant upcharge for the bigger engine but in addition to more power, the Grand Touring includes a pivoting Adaptive Front-lighting System (AFS), rain sensing wipers, an auto dimming rear view mirror, perforated leather seats, a moon roof, and HID headlights in addition to all of the goodies that come standard on the Mazda3i Grand Touring with the Technology Package. The 2014 Mazda3s Grand Touring sedan starts at $26,790 while the hatchback starts at $27,790. Those 2014 Mazda3s buyers who want better fuel economy and the bigger power output can opt for the $1,600 Grand Touring Technology Package that adds the fuel saving i-ELOOP regenerative braking system, front end grille shutters, automatic high beam controls and lane departure warning. In the long run, the 2014 Mazda3 may not be the cheapest car in the compact segment but it looks to be the most efficient while also being one of the most well appointed models when it arrives in showrooms later this year.